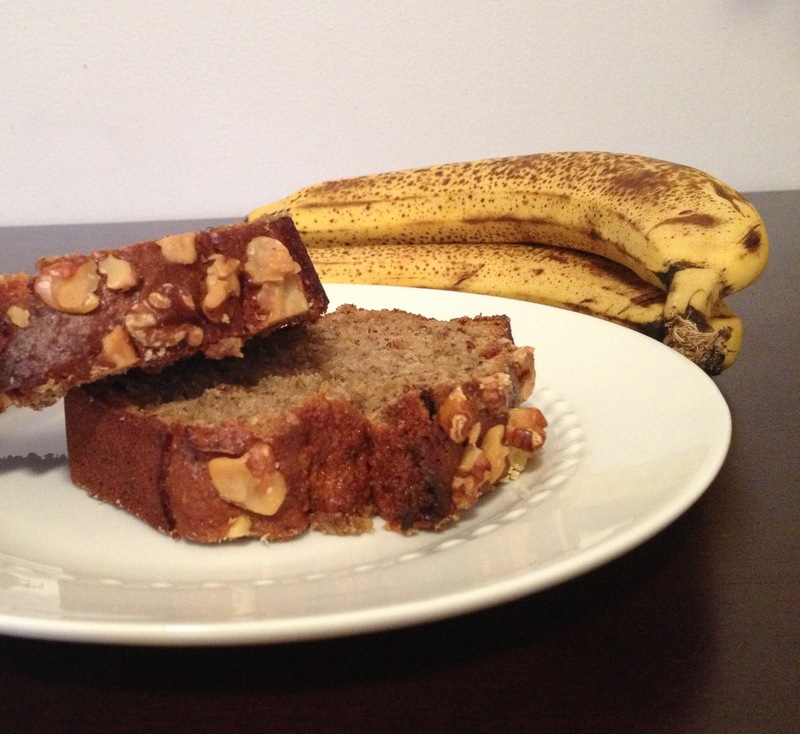 Your hunt for a perfect banana bread recipe is over. This subtly sweet recipe updates the classic banana bread without using any butter or oil, yet doesn’t sacrifice the moist texture and flavor banana bread is known to have. As good as grandma’s, but healthier! Sift the flours, baking soda, salt, and flaxseed meal to combine. Place the sugar and applesauce in a large bowl, and beat with a mixer at low speed until well blended (about 1 minute). Add the eggs, one at a time, beating well after each addition. Add the banana, yogurt, and vanilla extract; beat until blended. Slowly add the flour mixture to incorporate the wet and dry ingredients. Beat at a low speed just until moist. Stir in walnuts, reserving some to sprinkle on top of the batter. Coat two 8 x 3 ¾-inch aluminum foil loaf pans with cooking spray. Divide the batter in half and pour into pans. Sprinkle remaining walnuts on top. Place pans on a baking sheet and bake for 1 hour 10 minutes. The bread is fully baked when a wooden toothpick inserted in the center comes out clean (this area is usually the last area to set). Cool 10 minutes in the pan on a wire rack, then remove from pan to cool completely on a wire rack. Always lightly spoon flour into dry measuring cups and level with a knife. Don’t use the measuring cup to scoop the flour out of the container. You can end up with much more flour than the recipe indicates. If you prefer a less nutty flavor, you can make this recipe entirely with all-purpose flour; bake for 50 minutes and check on it to ensure it doesn’t overbake. 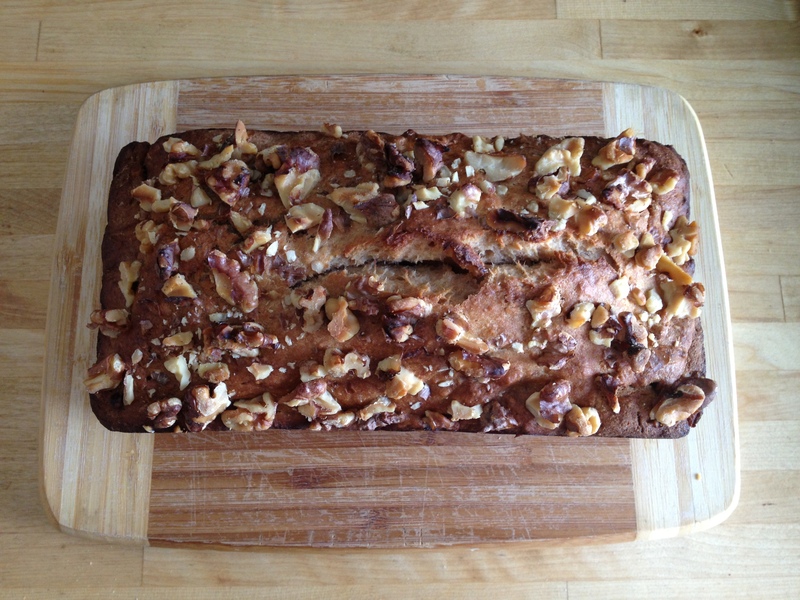 Banana bread should form a crack down the center as it bakes, a sign the baking soda is doing its job. Make sure to use ripe bananas. Their soft texture mashes and blends easily and creates the most intense flavor. Check the label on your applesauce container to ensure that it doesn’t contain sugar or high fructose corn syrup. If you prefer to bake one large loaf with this recipe, spoon batter into an 8 ½ x 4 ½-inch loaf pan and bake for 80 – 90 minutes. 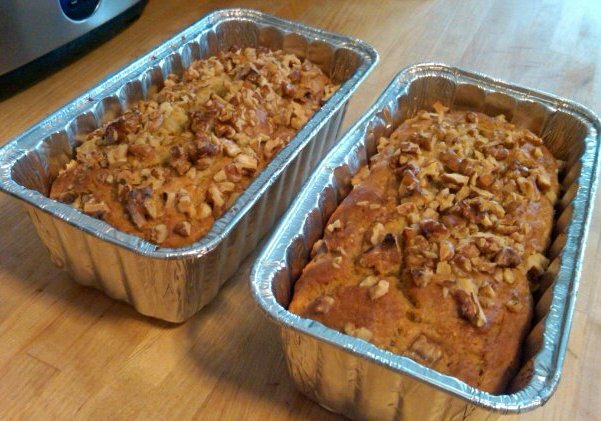 Two small loaves make it easy to share with a lucky friend!